UNITED NATIONS, September 29 -- When the UN's envoy to Afghanistan Staffan de Mistura took questions on Thursday, Inner City Press asked him about the UN's versus NATO's, that is ISAF's, violence figures. De Mistura replied that NATO's numbers are based on a "purely military point of view." He said, "if you are asking me if there has been an increase or decrease of civilian casualties, " there's been "a substantial and unfortunate increase... the Afghan people will tell you." After urging the press to "ask the Taliban" if they are willing to seriously negotiate, de Mistura prepared to leave. Inner City Press asked him for an update on the case of Louis Maxwell, the UN Security official by most accounts killed by Afghan National forces, without accountability. Video here, from Minute 5:07. 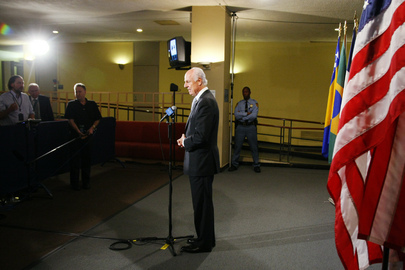 Thank you for asked me that, de Mistura came back to the microphone and said. He pointed out that it is not just Maxwell anymore, "it's also our Mazar-i-Sharif colleagues." He claimed the UN is following up, pushing for "final clarity." He said the same thing in July, and did not seem to have any new information. He said "Maxwell died for the UN, we should not let it down, we will pursue it, we do have an idea is what direction that happened." We'll see. Some in the UN have noted Ban Ki-moon's failure to defend the UN Security officers injured in a run in with the guards of Turkish Prime Minister Erdogan on September 23, when Ban quickly apologized to Erdogan. Afghanistan is less powerful than Turkey, but still there has been no accountability. Watch this site.